Email App on your iPhone is the simplest way to organize your email accounts. In our previous article we described how you can quickly perform important tasks using 3D touch and other options. You can even hand signature a document and resend it. On the email app whenever you swipe right or left on an email, you can find options such archive an email or to Mark it as read. You can also change these options as per your choice allowing you to quickly mark messages as unread or to quickly move them to another folder of your choice. 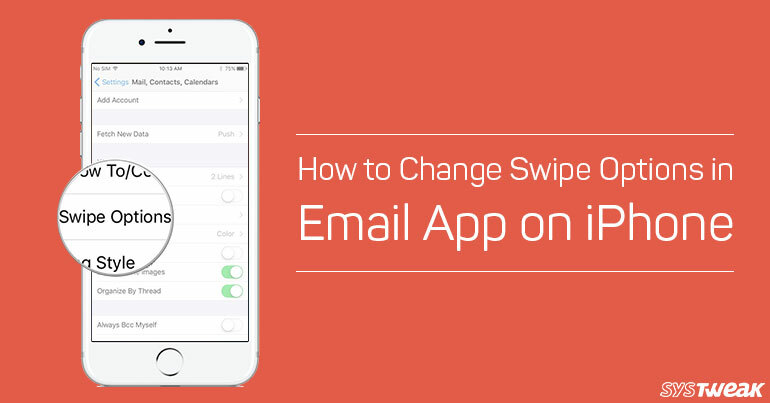 So if you’re unaware about these features, here’s how you can change Swipe Options in Email App on your iPhone. By default, on the right swipe you will get Mark as read option and on swiping left you will get an Option to Archive, Flag and More. To make changes to these default options head to settings from the home screen of your iPhone. Scroll down to Mail here you will see Swipe Options under Message list. When you will open swipe left options you will see Swipe left and swipe right settings on swipe left settings you can only change the second option first and the last options are fixed. To change the swipe left option tap on Swipe Left you will be able to choose from three options. One option will be grayed out because it is already selected under swipe right options. After choosing swipe left option you can choose Swipe Right You will see 4 options to choose from and the one which you have selected for Swipe left will be grayed out as you have chosen it on Swipe left menu. Once you are done with the selection of options open the email app and check by swiping right or left on any of the email messages. You will find the Options which you have chosen for Swipe left or right. This is how you can easily Mark a message as unread, move it to another folder or mark a flag to it. Apart from this from email settings menu you can also change flag style and increase the length of preview from 1 line to 5 lines.